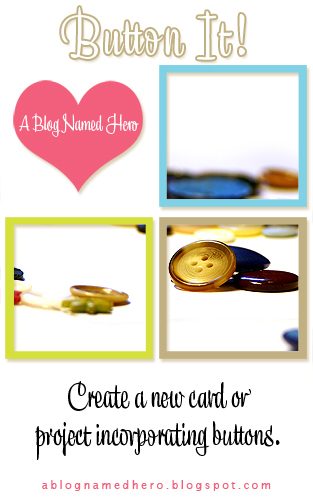 Hi everyone, Sue here with a couple cards to inspire you for our current Button Challenge. I don't use buttons very often on my projects, I just never know how to incorporate them into my card design. So I decided to pull out my buttons and see what I could come up with. My first project uses the negative space of a Hero Arts Silhouette Umbrella Cut File that I filled with pastel coloured Hero Arts buttons. I've had these buttons in my stash for a long time and am glad I was able to use some of them up. 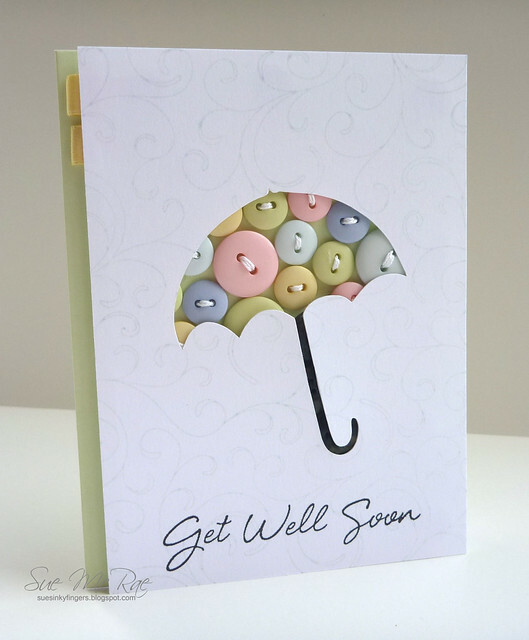 They add a fresh burst of colour and a little bit of texture to the card. Oh, and I also used black buttons for the umbrella stem. You can also easily do this technique with dies and punches. For my second card I wanted to make a fall coloured card but I didn't have the right shades of buttons so I took out my smallest buttons in white and clear and coloured them with Sharpie and Copic Markers. It's an easy way to get the perfect colour match for your card. I really struggled with filling the button holes for this card. I don't like leaving them empty, it just doesn't seem right but when I added thread I thought it overwhelmed the buttons and the design, so I tried gems and pearls in a variety of colours and didn't like that. What's your take on leaving button holes empty? I hope you get a chance to play along with our Button Challenge. 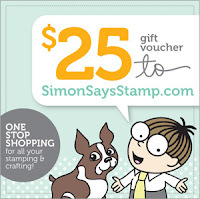 Someone will win a gift voucher to go buy crafty supplies from Simon Says Stamp.